Geothermal heat pumps, waste-oil furnaces and boilers, solar heating and air conditioning, coal / wood heaters. Replacement parts, controls, supplies, air filters, computer software, equipment and systems and thermostats. The place in 2019 for online for geothermal HVAC, solar heating, waste-oil, wood and coal burners. There may rebates or incentives in your area to install geothermal HVAC or solar heating units. There are dual-fuel furnaces and boilers like gas/wood or oil/wood or gas/coal and oil/coal-fired heating systems. ground-source heat pump (GSHP):A heat pump system that uses the thermal energy generated from the Earth's constant internal heat. GSHPs circulates a mixture of antifreeze and water through high-density plastic piping through closed loops buried in the ground. The ground's heat is absorbed through this circulation method and transferred back to the heat pump system. This process makes the heat pump more energy-efficient to operate; compared to a unit that relies on seasonal air temperatures. pressure drop:A measurement in inches of water column (W.C.) depicting the static pressure of air flow passing through an air filtration device or media. This is also dependent on the amount of CFMs (cubic feet per minute of air flow) a fan or blower is rated, the size of the ducting, and how much actual area (surface and depth) the filter displaces. An undersized or dirty air filter can cause conditioning problems and system failures. electric heat sequencer:A relay control that stages certain banks of electrical heat as a supplement for heat pump systems. Located in the air handler, these multi-layered devices are usually 24 volt controlled and cycle kilowatts (KW) of electric heat coils in "sequenced" intervals to provide auxiliary heat. The amount of KWs switched on is dependent upon the current temperature demand and the heat pump's ability to supply enough heat to maintain that demand. If you switch the thermostat to the emergency heat setting, the heat pump system de-energizes and the sequencer will stage each bank of electric heaters to the temperature demand. The emergency heat mode is only recommended as a backup heat source as it can be very costly to operate over long periods of usage. geothermal ground loop:Underground piping placed adjacent to the general site of the heat pump system. Most loop fields are installed vertically or horizontally in a high density plastic piping layout. The layout design depends on the size and rock density of the property. Close loops systems use the same water that is continuously circulated from the loop field to the heat pump system. Other types of loop fields are next to sources of water or use a direct-exchange method using copper tubing which provides a more effective thermal transfer then plastic tubing. Every design layout is different and an experienced geothermal HVAC contractor can offer different options and methods that would be the most efficient for your property. geothermal circulating pump:Mechanical device that circulates heated water from the geothermal loop field to the heat pump system. The water and antifreeze solution circulates through sealed, closed loop piping. Circulating pumps come in various sizes, speeds and voltages for different design applications and volume distributions. Pumps must be properly sized for the volume of water it needs to transfer through the ground loop and the size of the heat pump system. If not sized properly, the heat pump will not perform at its maximum efficiency. ground loop design software:Computer software designed to determine the piping size and layout design of geothermal systems. polyethylene pipe:(HDPE) High-density thermoplastic piping with a high strength-to-density ratio. In ground-source heat pump systems, this type of piping is used because of its heat transfer capabilities and is corrosion-resistant. vapor compression:A phase change a refrigerant goes through during its cycle. In heat pump terms, this would apply in the process of transferring the heated or cooled air and extracting it elsewhere. This is determined by the heat pump's mode of operation. In the cooling mode (air conditioning), the heated air transfers from the evaporator to the condenser where it is expelled. In the heating mode, the cycle is reversed. ambient temperature:The surrounding air temperature of a localized object. These range from indoor and outdoor temperatures. An indoor temperature controlled by a system that heats or cools the air can also be defined as room temperature. solar energy:A form of energy transmitted from the sun. The radiant energy is used by capturing the sun's thermal heat or light to generate electricity. differential temperature control:A solar thermal heating device that controls the pump in closed loop systems. This device prevents the pump from operating if the collectors become cooler than the storage tank. Some models have a fixed differential and others can be manually adjusted for different applications. solar heating panels:Also called collectors, solar panels trap the heat from the sun and transfers it to water for domestic or boiler (hydronic) use. The solar-heated water transfers to a storage tank. It is energy-efficient to heat the tempered water instead of the cold water that comes directly from a well or municipal water supply. expansion tanks:These specially designed tanks are engineered for domestic hot-water, hydronic and solar thermal systems to "absorb" excess water pressures. Expansion tanks usually contain a rubber diaphragm, charged with air, that expands due to fluctuating water temperatures and pressures. solar module:A photovoltaic (PV) celled panel used to collect sunlight and convert it to electrical current. Each panel is rated by direct current voltage and can output up to 400 watts of electricity. diverting valve:Electronic or thermostatically controlled, these valves are used in solar heating applications by directing the flow of heated water to other components. thermal conductivity of water:A technical specification used in solar thermal design to determine how rapidly heat transfers from the absorber tubes to the water that flows through them. The simplified calculation of the thermal conductivity of water is the heat being transferred per unit time and per unit surface area, divided by the temperature difference. gallons per hour (GPH):Term used to rate the amount of fuel that flows through an oil burner nozzle in one hour at a standard pressure of 100 psi. The proper size of a burner's nozzle should be stamped on the nameplate of the unit. furnace heat exchanger:A sealed metal chamber that is engineered in different sizes and forms depending on the model and type of fuel being burned. Attached to the combustion chamber, the heat and gases generated by the burned fuel travel through the inner part of the exchanger; heating the metal chamber as they pass through it. Air circulated by the furnace's blower, passes through the outer part of the heated exchanger producing warmer air. All internal combustion gases and unused heat are expelled through the chimney. potential btu output of waste oil:A BTU or British Thermal Unit is a measurement for the amount of heat generated to raise the temperature of one pound of water by one degree Fahrenheit. A gallon of waste vegetable oil generates around 125,000 BTUs. A gallon of waste motor oil produces 150,000 to 180,000 BTUs. Clean #2 fuel oil generates 138,000 - 140,000 BTUs per gallon. cad cell:Also called a fire-eye or photocell, a cad cell detects the flame emitted by an oil burner. Made from cadmium sulfide, the electrical resistance decreases when exposed to light, or in this instance a flame, to around 75-300 ohms. When the flame is not detected, it "tells" the primary control to shut down the oil burner system keeping unburned fuel from entering the combustion chamber. propylene glycol:A nontoxic chemical used as an antifreeze in closed piping boiler systems when exposed to below freezing temperatures. This type of glycol has a better heat transfer efficiency than Ethylene glycol. multi-fueled boiler or furnace:A hydronic or forced-air unit that uses wood or coal as the main source of heat, and is equipped with a control that switches to natural gas, propane (LP) gas, or fuel oil as a secondary heat source. Some systems use an automatic temperature changeover control while others have a manual switchover. barometric draft regulator:Also termed barometric damper, this round device regulates the flue (chimney)'s draft and stack temperature. Installed in the metal exhaust piping from a wood/coal boiler or furnace, the damper can be adjusted to minimize stack temperatures and maximize the energy efficiency of the system. A wood/coal-fired system needs a draft to burn properly and exhaust excess gases. Too much draft can result in expelling the heat the system is designed to produce, so there needs to be a "balance" between the two. Note: Not all systems need a barometric damper in the flue piping. Some units have an automatic draft regulator; others may be designed to be piped directly into the chimney. Tech Note: You cannot manually adjust this damper to obtain maximum efficiency. A draft gauge is used to determine readings of water column (WC) in the flue (breech) and over the fire (in the combustion chamber). Each manufacturer will recommend the draft settings for their equipment. catalytic combustor:A ceramic, honeycombed catalyst integrated in a wood-burning system that reduces smoke emissions, creosote build-up, and increases heat efficiency. The catalyst works by burning wood smoke at roughly 500-550 degrees Fahrenheit transforming the smoke into carbon dioxide and water vapor. The combustor heats up during the burning process producing a secondary heat source. Energy efficiency increases by decreasing the burn rate of wood needed to produce the same amount of heat without a catalyst. The principle is the same as a catalytic converter on an automobile's exhaust system. baffle plate:A cast iron or steel plate that sits in the top of a firebox or combustion chamber. The main purpose is to reduce the amount of generated heat from escaping out the chimney. Some plates are removable for cleaning while others are welded in place. flue mounted power venter:A separate device used to vent combustion gases outside. Installed at the end of a flue pipe when a draft-producing chimney is not available. The venter's motor produces negative pressure to pull gases from the heat exchanger to the outside. Do not confuse a power venter with an in-line draft inducer which aids in producing a positive-pressured draft. Tech Note: DO NOT use on wood-burning units! The risks, efficiency, and safety factors greatly outweigh any benefits. Check with your unit's manufacturer before installing a power venter on any fossil-fuel-fired system. There are solar powered high-efficiency heat pump and air conditioning systems on the market. This directory contains an index that will guide you to a specific solar, wood, waste oil or geothermal energy topic or item. This web page focuses on green HVAC energy systems like geothermal, solar, wood or coal. 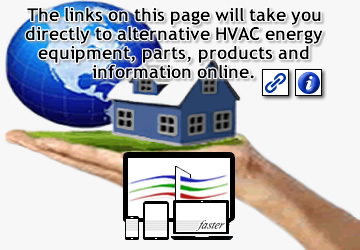 This site was developed for the technician, business owner, engineer, and homeowner to assist in finding or researching an alternative HVAC energy-related topic. The demand for geothermal heat pumps are rising every year. Solar is now being used to power HVAC systems and the use of heating water with solar is increasing.